I have received the shipment of books and puzzles and they are absolutely WONDERFUL! They are helping all of my students with the day-to-day concepts they are learning. My second grade student calls them her "Feeling Books". Thank you so much for helping me to enrich my students' learning. 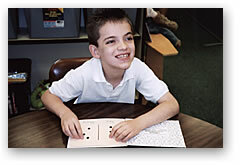 The Oakmont Visual Aids Workshop provides free materials for visually and/or mentally impaired children. 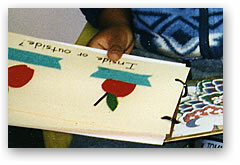 The learning aids are made by hand by a group of volunteers living at Oakmont Village, an Adult Community, in Santa Rosa California. Our nonprofit Workshop provides these books and games free of charge worldwide to any individuals working with visually and/or mentally impaired children. Please explore our website to learn more about us, view our products, and place an order. Do you already have our materials? Are some of them worn? If so, don't hesitate to replace them. Also check our Order Form and see if there are others you don't have. We will be pleased to send any you can use.